1 1/27/2019 3:32:00 AM - George I remember you can create multiple groups with Ctrl+number - it doesn't seem to work. Any idea how? 12/2/2018 11:49:00 PM - BabyShark This game is great to play single player too, but it's really a lot more fun to play with other players! We have a community that still plays Warcraft 2 in 2018 and welcome new players and of course returning oldies. Check us out at www.war2usa.com and join our Discord to find out when we play! 11/26/2018 10:10:00 PM - mike is there a way to a. get the mouse to move faster b. make it so that scrolling doesn't go super fast to the very edge of the map? 11/9/2018 11:51:00 PM - Jeff The sound doesnt work for me. Is this normal? 12/7/2017 9:59:00 AM - DEVIN game loads on dos box and then askes for the Warcraft 2 cd1 to be inserted?? Any Ideas?? 12/5/2017 8:19:00 AM - The game is prepared to be run in a Dosbox emulator. If you use Play NOW button, our engine will run the game for you. If you downloaded the game, you need to setup dosbox or any other dos emulation by yourself. But as the game is preconfigured for dosbox, you should be able to simply run it with drag&drop the start.bat on the dosbox icon. 2/13/2017 3:51:00 PM - by_ee No problem with tides of darkness but couldnt play beyond the dark portal. It says cd error. I did what you said, please help !! 12/24/2016 4:30:00 AM - dingadave that '3' is obviously meant as a '2', as perfect as I try to explain it I still run into simple grammatical errors..
12/24/2016 4:12:00 AM - dingadave [alt]+[enter] makes it full screen, I love this game so much. 12/24/2016 4:01:00 AM - dingadave sorry, I almost forgot. after mounting all the drives you must enter "c:" before you can enter the command "start.bat"
12/24/2016 3:55:00 AM - dingadave I got everything working in dosbox. step one: save extracted files in C:\games as war2. 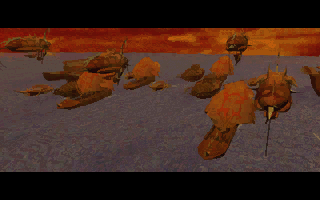 therefore it becomes c:\games\war2 step two: save the 'images' file as war2disc in the same 'games' folder, thus c:\games\war2disc step 3: go into dosbox and enter "mount c c:\games\war2" step 4: enter "imgmount d c:\games\war2disc\tod.iso -t cdrom" step 5: enter "imgmount e c:\games\war2disc\dp.iso -t cdrom" step 6: enter "start.bat" step 7:it works, you play it. 12/16/2016 2:23:00 PM - mikey will not allow me to play single player, claims i need the cd? how do i avoid this? 11/2/2016 2:49:00 PM - Sebastian I can run it on my DosBox, thx. 11/2/2016 2:27:00 PM - Sebastian Hi, I cannot play it in the browser. Are there any errors known? 10/25/2016 2:29:00 PM - Make the scroll rate slower Go into the War2 configuration file and play with the scroll rates at the top of the file. This worked very well for me. 8/24/2016 10:08:00 PM - baophat I get the x64 and x86 version of Window for this game. 7/26/2016 7:28:00 PM - Kyle Djun, I don't know if this will help you, I had a similar problem. 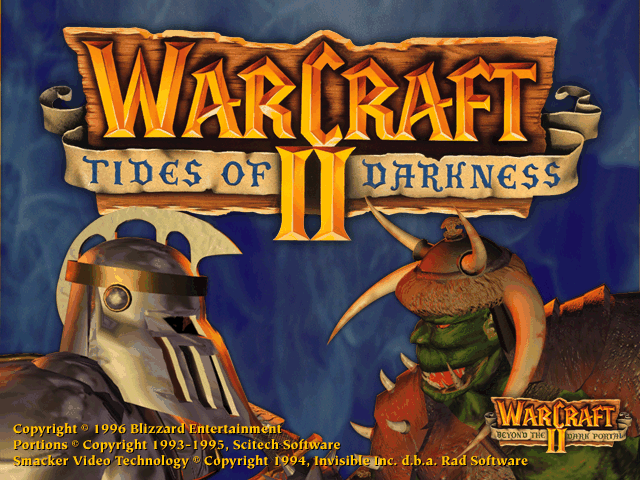 Maybe you can fix the problem by importing warcraft 2. By opening boxer, you can select import game, & from there drag warcraft 2 into boxer. maybe the whole folder, or just the executable, I'm not sure. 7/24/2016 6:05:00 PM - Djun running this on osx. same problem about the disc not found for single player. you mentionned 'put the disc files' in a previous comment in a different folder. Where are these 'disc files'? thanks for any help! 7/9/2016 9:09:00 PM - Mack Does anyone know about the 2.0 update? maybe it wasn't available to the old dos version or something. But I have a crude method of playing the old version, just doesn't seem to work very well, & it said that it was version 2.0. 7/8/2016 5:02:00 AM - Eric I have Windows 10 and it's not letting me play at all. Tried to DL it first then I chose Run In Browser and it said I needed the CD. Please help I really want to play this game again. 7/5/2016 4:36:00 PM - Caleb Also, Nick, I hoped you've solved your problem in the last 4 days, but you can adjust the configuration file for dosbox to solve your issue. Open the directory where you installed dosbox and there is a configuration file inside. Open it with any text editor. Change the line "cycles=auto" to "cycles=fixed [some number of your preference]". 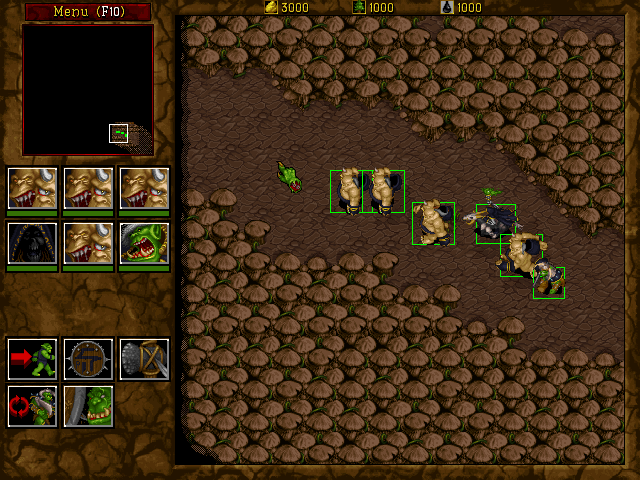 I find "cycles=fixed 20000" works well for Warcraft 2. 7/5/2016 4:31:00 PM - Caleb Since I assume you're running the game out of the browser and have installed it on your own machine, you downloaded the files that would be on the "disc". Copy all of these files into a folder somewhere (I installed Warcraft2 in C:/OldGames/War2 and put the disc files in C:/OldGames/War2/Disc). When running the game, mount C drive as normal, and then mount D drive as follows: mount D C:/OldGames/War2/Disc -t cdrom. This will treat that directory as your disc drive and if you've placed the disc files inside should allow you to play single player. 7/2/2016 1:11:00 AM - Andrew I'm getting a CD not found problem and going through the comments, I can't seem to get any of the suggestions to work. The game loads but the CD doesn't. Do I need to mount the CDrom with Dosbox? One of the comments suggested starting it with the start.bat file but that doesn't seem to be working. The file directory I created was \warcrft2. Thoughts? 6/28/2016 11:07:00 PM - Mark Ok, I seem to have fixed it, maybe I just thought that I remembered the food count being shown on the top right of the screen. Thank you lodine. 6/28/2016 7:22:00 PM - Mark After opening the game, you can go up top of the computer, where it says "Drives" then show drives. It should bring up a new window, go to CPU, & play with the CPU speed. 6/24/2016 2:22:00 AM - Mark I find that it either does not find the file directory, or it has an error "error ept0018: Failure Opening New File: C:\WARCRAFT\DATA\RTa61662" I could not find the rta61662 in the warcraft/data directory. 6/23/2016 10:53:00 PM - Iodine http://warcrafttwo.tripod.com/id9.html It said that the patch was applied properly, but in the game load screen it still says 1.3... so who knows? 6/23/2016 7:49:00 PM - Mark Where can I download the patch? 6/22/2016 2:21:00 AM - Iodine I was able to apply the patch by downloading it and extracting it to the same directory as my warcraft (c:\warcraft2) and then by mounting dosbox with the command: mount c c:\warcraft2 and then run the executable of the patch c:\w2xptch.exe follow the instructions and when it asks to pick a directory, just type in c:\ because dosbox understands c:\warcraft2 folder to be c:\ and it works. 6/20/2016 6:13:00 PM - Mark I recall playing this in my childhood, but it feels different from back then, is this normal? 6/20/2016 3:08:00 AM - Iodine If you run it in dosbox after downloading the iso files, then hit CTRL F11/F12 - you can decrease/increase the CPU speed the game runs at. I found 20-25% (Along with minimum scroll speed settings) to alleviate the hyper-scrolling. 6/20/2016 3:00:00 AM - Iodine If you run it in dosbox after downloading the iso files, then hit CTRL F11 - you can decrease the CPU speed the game runs at. I found 20-25% (Along with minimum scroll speed settings) to alleviate the hyper-scrolling. 6/19/2016 7:50:00 PM - is there a recommended room to chat and find multiplayer counterparts in? would like some friendly competition and dont want to spam the wrong room. 6/17/2016 9:17:00 AM - Hi, I looked at the scripts and one more thing is needed if you try to run the game on your own, game folder must be mounted as C.
6/16/2016 7:40:00 AM - War... Hey, I downloaded this, used DOSBOX, ran it by going to the correct folder and typing "start.bat". It launched War 2, but it says I don't have the Cd. any suggestions? 6/15/2016 8:09:00 AM - The game package includes the CD images in IMAGES folder. if you start the game with START.BAT in dosbox, the script will load the iso images automatically to dosbox virtual CD-ROM drive based on your initial selection. If you however do not use dosbox or do not use START.BAT or both, the isos will not be mounted automatically. So I suggest you to download dosbox (is available for MACs and Androids too) and start the game with START.BAT. Or you need to find out, how to mount the CD images in your emulator manualy. 6/15/2016 7:35:00 AM - BMAX When I try to play in campaign mode it says I need the CD... I'm using Boxer as my emulator. I don't really care to play online I'd just like to go through the campaigns. I'm playing on at late 2010 MacBook pro if that helps. 6/15/2016 6:18:00 AM - CADEMAN Using DosBox Start file won't let me play without CD what am i suppose to play the game with? 5/26/2016 9:59:00 PM - Benjamin I'm not sure how to help you then, I was able to download the game & "Boxer" just fine. After that, I was able to open "START.BAT" with Boxer. 5/24/2016 9:17:00 PM - I have the free version of dosbox. When I tried downloading the files it just get queued and won't dl. 5/20/2016 6:37:00 PM - Benjamin I found that 'Boxer' worked fairly well, if you want to take a look at it. 4/21/2016 10:22:00 AM - Phil, you need an emulator to run the game. But if you are not good at this, the purpose of this page is to allow you to play the game instantly from the web just clicking the Play NOW! button. 4/19/2016 2:40:00 PM - Phil Hey guys, I am not really good with this, can somebody tell me how to install the game after downlaoding the files? Thhhxx! 4/10/2016 12:35:00 AM - Harry The Good ol' Days are back! 3/18/2016 9:58:00 PM - Christian Though, I am wondering if the Warcraft 2 1.5 patch is included, & if so, how to get them. 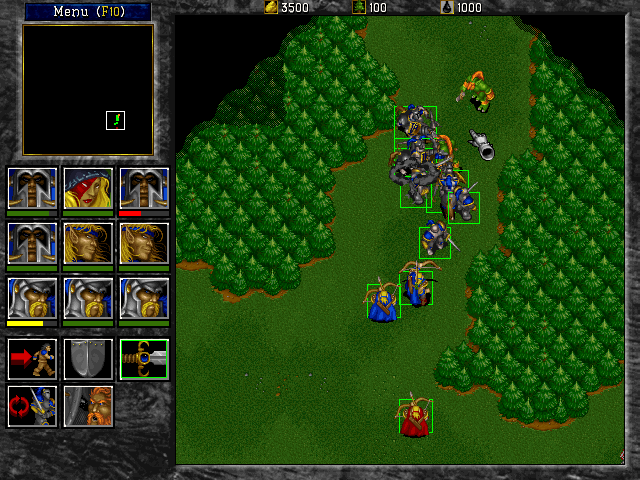 3/15/2016 6:49:00 PM - Christian I was too comfortable with the more modernized version of the attack command from Startcraft II, but I think that this is awesome that Warcraft II is finally playable once again! 3/15/2016 6:48:00 PM - Christian I would like to apologize, for complaining about the attack button not working properly, & about complaining about this not being the version I'm used to, & masking each of these comments in 3 o 4 names. 3/14/2016 8:34:00 PM - Benjamin Oh sweet! I love this game! Anyone know how to update the 1.33 & 1.5? Or is that not available for the Dos Box? 2/28/2016 5:15:00 PM - raul best game i ever played in my childhood. 2/13/2016 4:53:00 PM - Carsten If i use the Editor (not downloaded the game), only with the PlayNOW Button... Is it possible to get the saved Map on my PC? 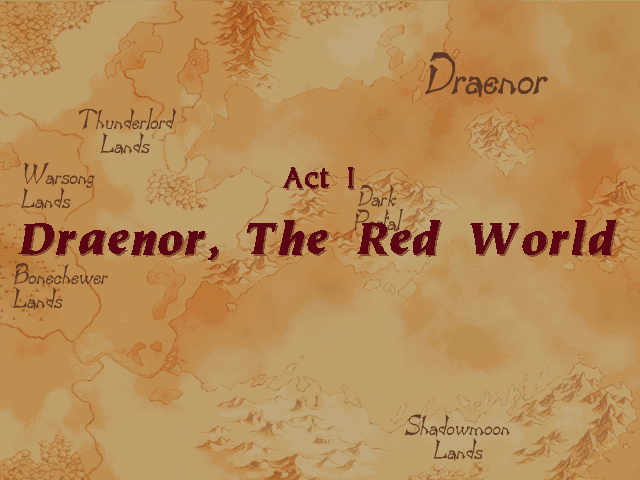 Or a other Question, where do i have to save the Map to play it? I canÄt find the Map if i run the game... Sorry for my bad english ;) greetings from germany!!! 2/8/2016 7:46:00 PM - Ben Anyone know why my units attack commands seem to not attack units until thy stop moving, just like the move command? 1/17/2016 6:04:00 AM - I am finding that I can't play my custom games or any of the custom games that are in the game files. 12/8/2015 9:43:00 PM - David I think that in order to play your customs, you would have to save them in a file that can be accessed from in the game. You can also try moving the folder if you can't seem to save it to the appropriate location. 12/2/2015 6:52:00 AM - Erry Map editor works, but do you know of a way how i can play my custom games?. It cant find the customs unless im missing something. 11/23/2015 12:58:00 PM - mijota666 i cant play without the CD... isnt this download modded? 11/21/2015 2:52:00 AM - Christian Does anyone else notice that your units get hurt & killed, from an enemy who's nearby, without doing anything about it? 11/16/2015 10:21:00 PM - Rob Is there a way to bring it like the old mac version, where the automatically attack anyone they see on the way, rather than just when attacked? 11/5/2015 10:09:00 PM - David I've found that, with the attack command, if a unit is attacked then it will stop and fight, but the rest of them travelling with it will continue on. 11/3/2015 7:49:00 PM - bananaman sooo i tried to install the emulater and it said it cant run independatly any tips?? 11/3/2015 4:06:00 AM - Map Editor works but the cursor jumps all over making it impossible to use. Any fix for this? 10/18/2015 4:37:00 AM - Rob What's the difference between the move command, & the attack command, from in game? 10/6/2015 5:06:00 PM - The new version of game is available with the Map Editor enabled. Please note that the update may destroy your saved files. 10/3/2015 2:44:00 AM - Nemneb Great! Thank you so much!!! 10/1/2015 8:50:00 AM - This version doesn't seems to have one, but thanks for a good point, I'll try to add it somehow. 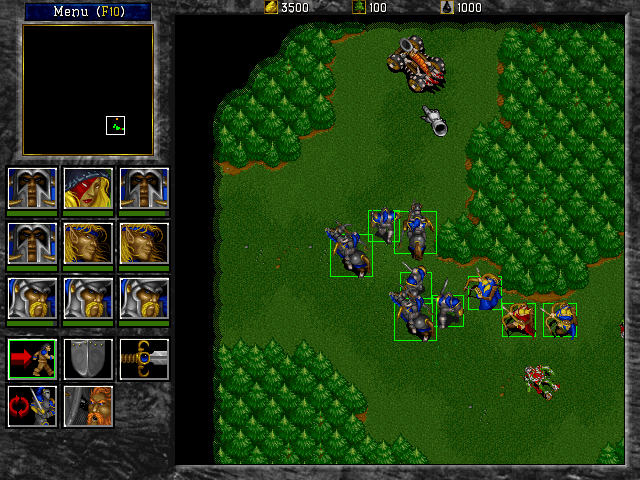 9/29/2015 5:40:00 PM - Nemneb Does anyone know how to open, or find, the warcraft 2 map editor? I am using mac os x 10.7.5 & can't seem to find it. 9/29/2015 5:37:00 PM - Nemneb Does anyone know how to use the map editor? I'm running a mac with mac os x 10.7.5, & can't seem to find it anywhere. 8/20/2015 2:29:00 AM - Steve Scroll speeds make this game pretty much unplayable. Any way to fix this? 7/4/2015 2:01:00 AM - kb been fighting to get this to work for hours, nocd cracks weren't working, kept saying i needed the cd. simply opened start.bat using Dosbox and it finally worked!! big thanks!! 5/23/2015 8:55:00 PM - JD I can't seem to save the game, any ideas? 5/2/2015 2:43:00 PM - Has anyone figured out how to run the custom scenarios, I can't seem to access any of the pud files. 4/11/2015 2:17:00 AM - snd I read the comment to bypass the disk request, one needed to drop the start.bat file onto the desktop, then start from there. Where is the start.bat file? 4/5/2015 8:23:00 PM - BuRnT Claw is right! Visit http://en.war2.ru it is a great place to play Warcraft 2. 3/19/2015 5:54:00 AM - David.N To make the game work simply drag the Start.Bat file and drop it onto Dosbox and select your options and play. Doesn't ask for CD. Worked fine for me. 2/5/2015 10:33:00 PM - Dunois I keep getting the "need cd to play game" prompt. How do I get around that? 2/1/2015 11:39:00 AM - mouse speed is way to fast to paly. what do i do? 1/15/2015 10:00:00 PM - is there any way to change the mouse scroll speed it is way to fast to play properly, but everything else is perfect! 1/13/2015 4:28:00 PM - Stephen scroll speed is way too fast! How do you lower the cycle speed? 4/24/2014 12:57:00 AM - BuRnT http://www.war2server.com Warcraft II free download & online multiplayer server! 3/29/2014 8:49:00 PM - Ryan If AsgardBeast's instructions don't work, attempt to fool the cd-drive by running [mount c c:\], then [mount c e:\ -t cdrom -icos] and run the program afterwards. I've successfully run a few games this way looking for cd-drive initialization. 2/5/2014 1:36:00 PM - AsgardBeast The CD request is an easy fix. The default START.BAT file that is provided is written assuming that the directory is mounted as the C:\ root directoy. If you modify the START.BAT you can fix this issue and it will properly mount the ISO images regardless of how the files are mounted in DosBox. Find the lines in the START.BAT that begin with imgmount. and change them from "imgmount D C:\IMAGES\ToD.ISO -t cdrom" to "imgmount D .\IMAGES\ToD.ISO -t cdrom" and everything should work fine. I also took out the exit command from the very end of the file because I don't want it closing my DosBOX window when finished. 2/4/2014 3:35:00 AM - giovanni Seul s'est bon!! 1/30/2014 10:35:00 PM - giovanni Seul s'est bon. 1/5/2014 1:57:00 PM - FraaGameEmpire This is strange, PlayNOW only mounts the game directory as "C" drive (START.BAT must be in the root of C:\) and executes START.BAT. Dosbox 0.74 should be OK. But you can check the downloaded version. Search for "Packages" directory on your C drive, there will be all the downloaded games plus the dosbox which is used to run them. 1/4/2014 5:19:00 PM - Dryzun So I did a little more to try to figure this out, and apparently the game does work perfectly on the Play Now (.NET) that seems to run through dosbox, so my guess is that either a different version was downloaded through that program or it did something slightly different to start the game up/install it... but I'm not sure what at all. 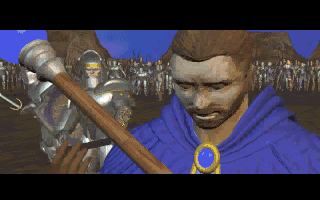 1/4/2014 4:50:00 PM - Dryzun So I am trying in DosBox, Open dosbox, mount my games folder, navigate to the Warcraft 2 folder, then type start to run start.bat When I do this, it asks me which I want to play, Tides of Darkness or Beyond the Dark Portal... Regardless of which I choose, if I then enter the game and choose to play a single player game it says that a CD is required to be in the CD drive, and will not continue from that point on. 1/4/2014 8:51:00 AM - FreeGameEmpire Hi Jacques. All our games are prepared to be run in dosbox and with our applet with a single click so they may vary from the original. If you do not use our applet, you must download dosbox and run START.BAT in it, probably mount the game directory too. 1/4/2014 5:46:00 AM - Jacques That doesn't work. Did you include the cd files with the download? I'm using MagicISO on the .iso files with it but that doesn't work. Do I have to modify the target commands within the .exe files? Do I have to take the files out of the images folder and put them in the base folder? Thanks for reading. 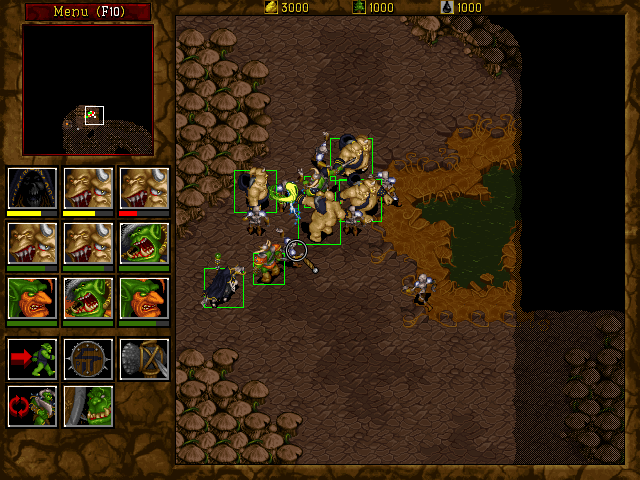 12/28/2013 1:11:00 PM - FreeGameEmpire You need to run the game in dosbox or use our applet (Play NOW! button). In any way, you need to run the game with START.BAT file and select correct game type to eliminate the CD request. 12/22/2013 10:49:00 PM - Jacques How do you run it on DOSBox in the C drive labelled as WC2?